Early in the morning of January 6, Russian radars stationed around Latakia, Syria detected no less than thirteen kamikaze drones approaching. Ten of the explosive-laden unmanned vehicles streaked towards Hmeimim airbase, while three others swooped towards the Russian naval base at Tartus. Just a week earlier, Hmeimim had sustained a mortar attack that killed two personnel and likely damaged several aircraft. According to Moscow, electronic-warfare assets allowed them to take control of six of the drones. The remaining seven were blasted out of the sky by Pantsir-S antiaircraft vehicles, which combine two rapid firing thirty-millimeter autocannons with a twelve surface-to-air missiles (SAMs). 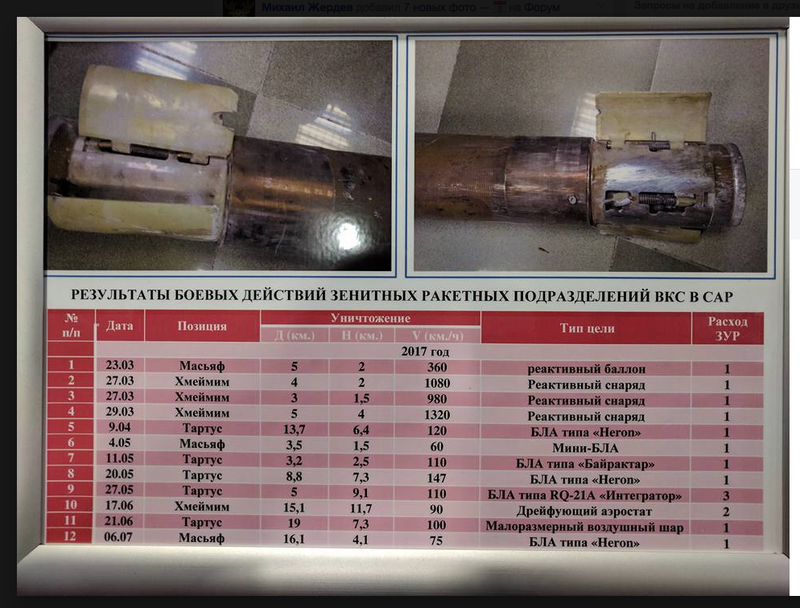 A poster presented at a Russian arms expo claims to detail additional activity by Russian military Pantsirs in Syria, including the destruction of a number of drones around the naval base of Tartus: a Turkish Bayraktar drone in May, three Israeli Heron drones between April and July, and on May 27 an RQ-21A Blackjack, a roughly one-hundred-pound recon drone used by the U.S. Navy and Marine Corps. It also lists intercepts of three unguided rockets around Hmeimim airbase—with the Russian government claiming at least two more rocket intercepts in December 2017. A Syrian Pantsir is alleged to have shot down a Turkish RF-4 Phantom reconnaissance jet in 2012, though it is also possible that a longer-range missile system was responsible. Pantsirs have also been spotted in territory held by Russian-backed separatists in eastern Ukraine. The Pantsir (“Armor” or “Carapace”), which is also known by the NATO codename SA-22 Greyhound, is descended from a line of Soviet-era weapons meant to protect tank battalions from air attack, starting with deadly ZSU-23-4 “Shilka,” which was based on the chassis of a PT-76 amphibious tank. In contrast to preceding self-propelled flak guns, the Shilka introduced an onboard radar to guide the four rapid-firing twenty-three-millimeter cannons in its turret, allowing it to rip low-flying jets and helicopters to shreds with little forewarning. In one action during the Yom Kippur War, Egyptian Shilkas destroyed three low-flying Israeli Phantom jets on an air-defense suppression mission, and crippled two more. While the Shilka remain in service across the world, the type was succeeded in the 1980s by smaller production run of more sophisticated 2K22 Tunguska (SA-19) vehicles, which swapped the quad guns for twin thirty-millimeter cannons—research had shown fewer, larger shells were more likely to down a plane than many small ones—and added on better radar and eight surface-to-air missiles, dramatically enlarging the system’s engagement range. This extra firepower was hoped to suffice for defeating NATO’s then-new armored A-10 Thunderbolt attack jets and Apache helicopter gunships. In the 1990s, Russia began working on a Tunguska successor, swapping out the tracked, armored chassis for a truck body and increasing the missile load to twelve. While the armored Tunguska was suitable for accompanying tanks over rough terrain on the frontline, the idea was to make a cheaper but faster road-mobile system suitable for rear-area point-defense duty, including protection of long-range SAM batteries from incoming antiradar missiles and low-flying aircraft. This Pantsir has gone through many variations since the first prototype debuted in 1995, with varying truck chassis and radar configurations. The most prevalent model in Russian service uses a Kamaz 6560 truck and has a crew of three. A Pantsir can operate independently, or an entire battery can be slaved to control of a command post or a more powerful radar unit, from which the vehicles can receive firing orders. The antiaircraft system can detect approaching aircraft up to around twenty-two miles away using its Passive Electronically Scanned Array search radar. This allows it to cue its shorter-range but more precise engagement radar to begin locking onto a target from fifteen miles away—a process that can be accomplished in just six seconds. Additionally, the Pantsir has an electro-optical tracking turret with multiple imaging systems including a thermal channel as a backup sensor, particularly if jamming impairs the radar’s performance. Once a targeting solution is acquired, the Pantsir can ripple-fire up to four missiles at two or three different targets at the same time, with just 1.5 seconds between each launch. A total of twelve are slung in launch containers on either side of the turret, and they can reach targets up to twelve miles away, and between near ground-level and fifty thousand feet high. The 57E6 missiles don’t have any onboard guidance systems, but instead continually receive targeting data via radio from the launch vehicle until they detonate near the target while soaring at Mach 3, supposedly with an estimated 70 percent hit probability. If the missiles don’t do the trick, the Pantsir can engage incoming targets with its rapid-fire thirty-millimeter cannons housed in its rotating gun turret. The 2A38M cannons can rip out up to forty rounds per second each—two or three times the rate of fire of most machine guns—and can hit aerial targets up to two miles distant. The Pantsirs in Syria have attracted less attention than long-range weapons like the S-400, because it’s easier to avoid the smaller protected radius that the former defend. However, a Pantsir battery will typically be the lowest-tier of multi-layer integrated air-defense system, which also incorporates long-range high-altitude systems like the S-400, and medium-range SAMs such as the Buk or S-350. The short-range Pantsir serves as a final line of defense, as well as a counter to low-flying planes and helicopters, missiles, drones and even rocket artillery. This capability is crucial in the current age of guided missile proliferation: reportedly the Pantsir successfully shot down a cruise missile in a 2012 test, and hit targets traveling at nearly three times the speed of sound in a later test. Integrated air defense networks can be taken apart from the air by a coordinated suppression campaign, and short-range air defenses in particular can be countered by coordinated use of long-range missiles and bombs. But doing so requires planning, time, and more expensive weapons and aircraft, which may not be readily available in a high-intensity conflict. In the case of missiles, short-range air defenses will also have a better shot at thinning out the incoming warheads before they strike. The Pantsir has had only modest export success in the Middle East and Africa, perhaps due to the system’s non-negligible cost of roughly $13 to $15 million, with between thirty-five to fifty each in service or on order with Algeria, Iraq, Syria, the UAE and Jordan. Over a hundred Pantsirs reportedly serve with the Russian military, and there are supposedly plans to install a navalized version on the aircraft carrier Kuznetsov. A modernized Pantsir-S2 debuted in 2015 with a more powerful radar that can detect targets up to twenty-five miles away and improved 57E6-E missiles with a range of eighteen miles. Russia has also introduced the Pantsyr-SA, an arctic warfare variant using an all-terrain vehicle chassis, which ditches the cannons for six extra missiles that can function at negative fifty degrees Celsius. Defense officials claim that a new Pantsyr-SM model under development will be capable of engaging ballistic-missile targets traveling several kilometers a second, normally a tall order for a short-range system. The U.S. military doesn’t have a short-range air-defense system nearly as capable as the Pantsir. This is because the American ground forces have been able to count on the Air Force to clear the skies of aerial threats, while Russia’s military expects that its ground troops could come under sustained air attack—which is why they have developed such a diverse array of air-defense systems. However, air superiority may not be achieved immediately in the crucial early phase of a conflict. More importantly, the mass drone attack in Syria perfectly illustrates why UAVs are making ground-based air defense essential. While U.S. fighters have shot down several drones over Syria, the jet fuel and guided missiles expended in such intercepts are likely far more expensive than the targets they are swatting—and few patrolling jets would struggle to counter a massed attack. Therefore, the mass drone attack on the Russian base in Syria—the largest of its kind to occur so far—is likely a harbinger of what is to come.